In my first post about the Galápagos trip, I showed you photos of the beloved and iconic blue-footed boobies. Most of those images were made on North Seymour, a small island that’s host to large colonies of the boobies as well as frigatebirds. So let’s continue with the wonders of North Seymour. As our zodiac left the ship and approached this restricted-access island, I was enthralled by the sight of a sky filled with enormous birds soaring over us. Magnificent frigatebirds (Fregata magnificens) are aptly named, because they are simply spectacular. Most days there were small groups of them soaring above the ship, giving us dramatic close views. With a wingspan of up to 8 feet, this giant seabird is often called a pirate of the sky because of its habit of stealing food from other birds. You see, the frigatebird doesn’t have waterproof feathers like most other seabirds, making it unable to dive into the sea for its food. It can grab fish from the surface with its hooked bill, but more often it seems to prefer taking food from boobies and other seabirds. The first time I witnessed this thieving behavior was on Kaua’i, where I photographed two great frigatebirds (Fregata minor) forcing a red-footed booby (Sula sula) to drop its food. In this photo you can see the food is falling as the booby squawks its displeasure. 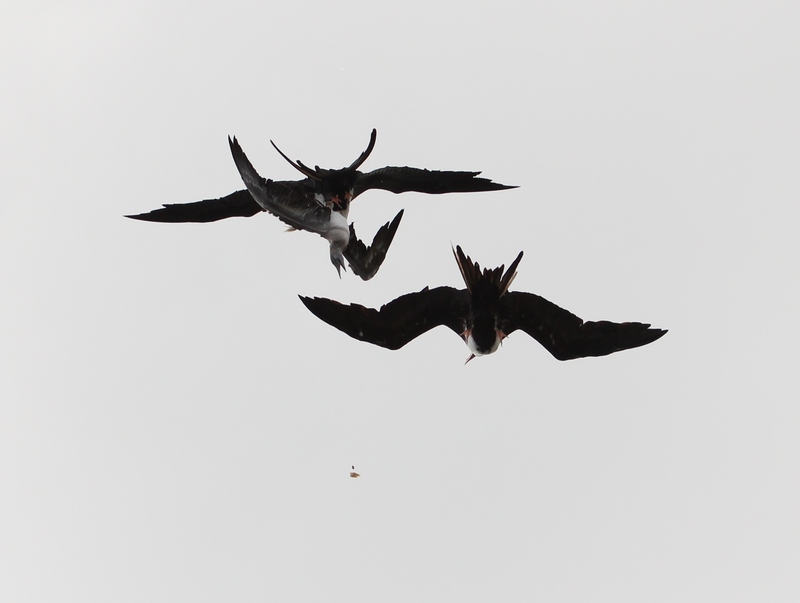 After the food is released by the booby, the frigatebird swoops below to grab it before it hits the water. It’s all very dramatic and fun to watch. On North Seymour we were treated to close encounters with lots of nesting frigatebirds, and got to see their courtship behavior. While they don’t have a cute dance ritual like the boobies do, the male frigatebird has his own unique method of attracting a mate. He inflates his gular sac, a red pouch on his throat, which serves as the signal to all the ladies that he is an eligible bachelor. The island was dotted with males displaying their enormous scarlet gular sacs, eyes looking skyward, each one patiently waiting for a female to choose him. Once the female selects her mate, the two commence nest building. Usually the female stays on the nest to protect it from stick thieves, while the male goes out and gathers more sticks. Both the magnificent and great frigatebirds live and breed in the Galápagos. 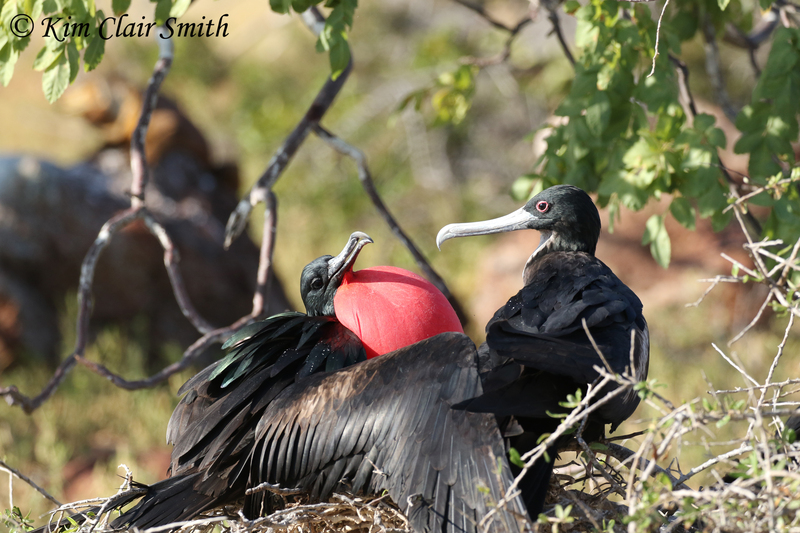 Here’s a pair of great frigatebirds on a nest. Compare the female in this picture with the female in the photo above; the magnificent has a blue eye ring while the great has a red eye ring. North Seymour island was perhaps one of my favorite places of this entire trip. It was a wild and remote place, teeming with a great variety of animals. And as much as I loved the spectacle of the blue-footed boobies and the frigatebirds, there was another creature on this island that unexpectedly stole my heart. 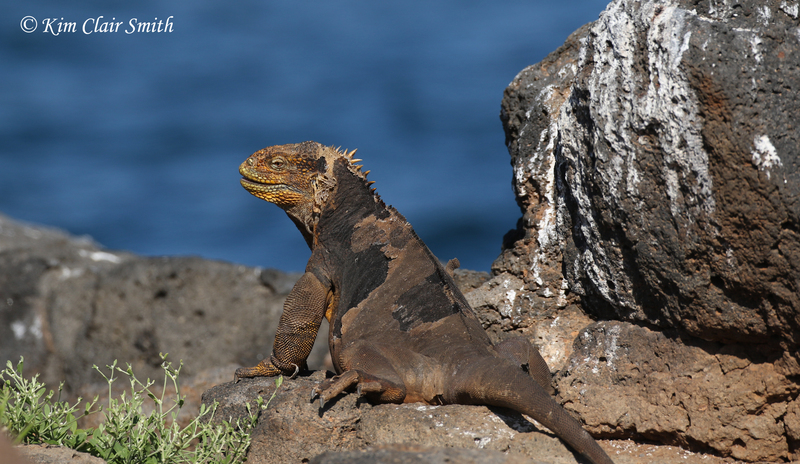 On other islands earlier in the week, I’d seen lots of tiny lava lizards and medium-sized marine iguanas, but nothing had prepared me for the stunning beauty of the lizards on this island. 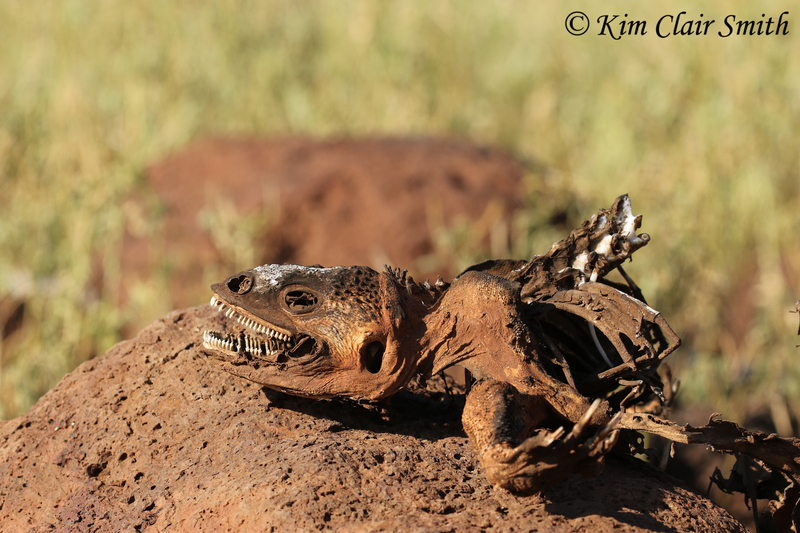 Meet Conolophus subcristatus, the Galapagos land iguana. These guys were just everywhere, often right beside the trail resting in the shade as dozens of awed humans walked past them. Our naturalist guide was counting them, trying to beat her personal high count of about 70 on a one-hour walk. I think we counted almost 50 on this day, and I’m sure we missed plenty of them as we were distracted by boobies and frigatebirds overhead or sea lions on the rocky shores. Even today, more than a week after the trip, I’m blown away when I look at these lizards. You should have seen them in all their majesty, lumbering across the hot sand and rocks, adorned in the colors of the sun! They make me wish I were an artist so I could draw or paint them. Luckily for me, I was able to purchase an original painting from a local artist to commemorate the feelings I had as I watched these equatorial dragons roaming their kingdom. I can’t wait to get this painting framed so it can hang in my home. I’ve joked with friends that I’m the only person they know with giant photos of dragonflies and other insects on their living room walls…just wait until they see this hanging over the sofa! This last image isn’t mine; it was taken by one of the ship’s naturalists, and given to us at the end of the cruise, along with hundreds of other photos from the week’s adventures. 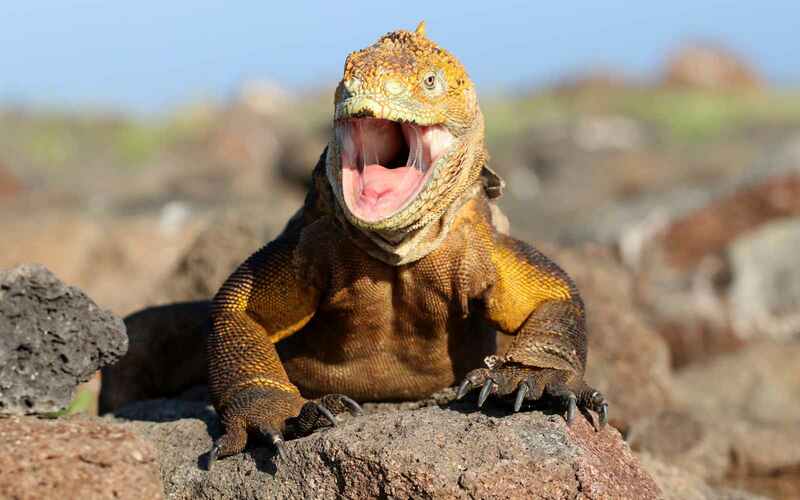 I like to think that if I’d been allowed to spend more time with these iguanas, I could have come up with an image like this on my own. Maybe one day I’ll get another chance. These first two posts have barely made a dent in this trip report, so next time I’ll show you even more natural wonders of the Galápagos! This entry was posted in Birds and tagged birds, booby, frigatebird, Galápagos, kleptoparasitism, North Seymour. Bookmark the permalink. So educational and fun to read your posts! 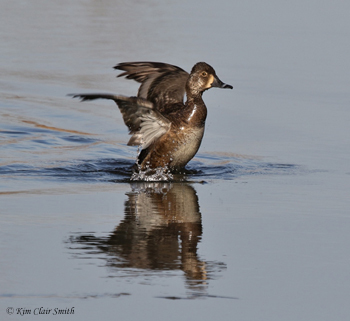 I truly enjoyed this post, and am totally head over heels about the photographs! I was pleased to see the skeleton photo, because, like Ardys, that is exactly what I would have done myself! 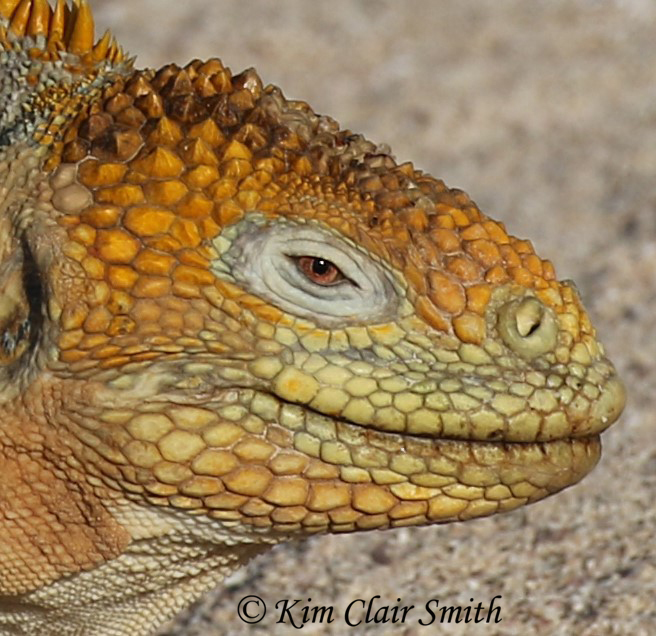 Those land iguanas are stunning! I delighted in learning about the frigate birds – I found it amusing to note that while they steal food from the boobies, they have to deal with stick thieves in the nest building process. The lives of wildlife are not so different from what we humans must deal with! Great write-up, Kim!! I’m salivating with anticipation for the next post in this series! Oh Lori, I’m so glad you liked it. I wish you could have been there with me! They would have had to drag us off that island because we would be having so much fun finding interesting things to photograph. The teeth in the skeleton photo is very interesting. I have bug pictures on my walls, too! Ha! Hi Debbie, and thanks for reading. It’s always great to connect with a fellow insect lover! The skeleton photo is like something I would take! It’s all so interesting Kim, thank you for sharing it with us.